Almost every pet battles with skin itchiness at some point. 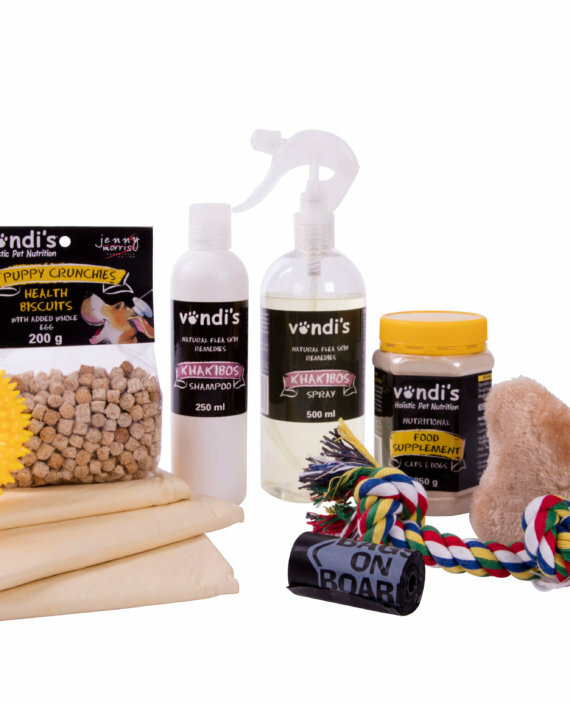 The Vondi’s Itchy Skin Bundle includes everything you need to manage your pet’s itchy skin, in a natural way. 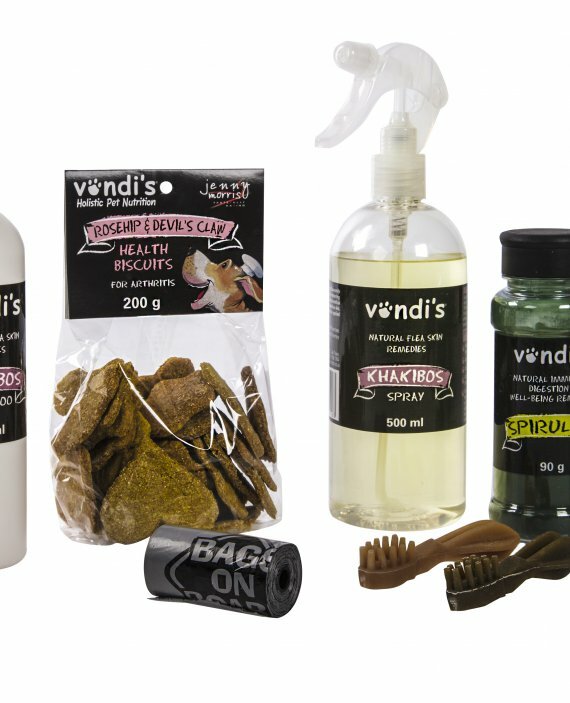 Vondi’s Itchy Skin Bundle includes everything you need to manage your pet’s itchy skin, in a natural way. The pack contains five products proven to reduce skin itchiness if used correctly. Khakibos is well-known as a natural flea and tick repellent. Safe, natural and very gentle on the skin, Khakibos can be sprayed directly onto your pet and/or their linen. The spray is ideal for dogs and some cats do not mind being sprayed. It can also be used as a rinse for your pet’s laundry. It’s a natural inclination to want to bathe our pets when they have a skin irritation to relieve the itchiness, but using a chemical-based shampoo in doing so may further aggravate the condition. 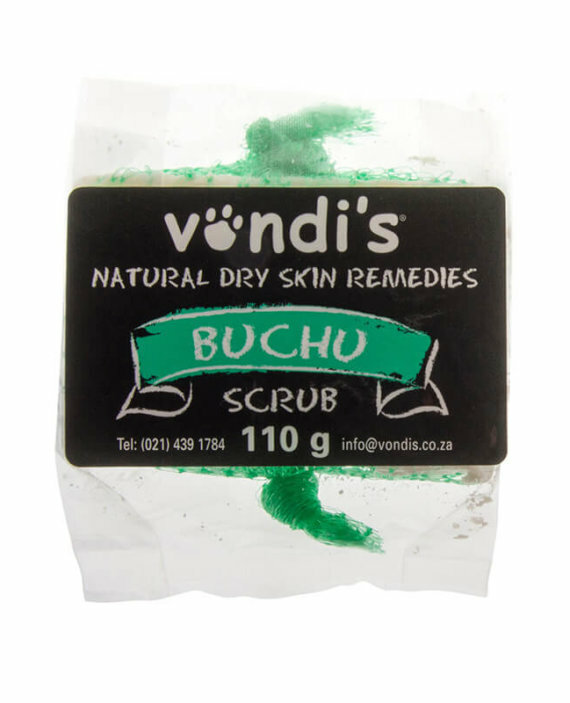 Vondi’s Buchu Scrub is an effective anti-bacterial and anti-inflammatory product. The Buchu soap scrub alleviates skin irritation and itchiness. Buchu not only cleans the skin but also cools it. 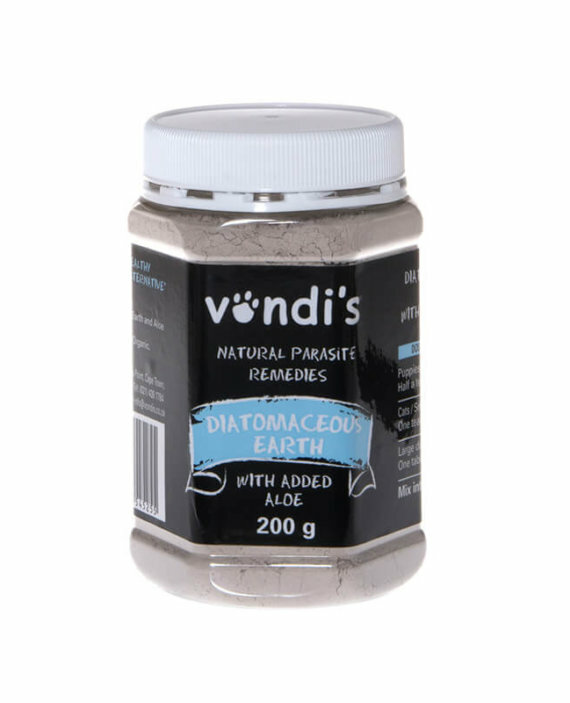 Vondi’s Rooibos Oil contains a wonderful infusion of rooibos, chamomile and Spirulina with grapeseed oil for alleviating skin allergies, scratching and skin irritation. 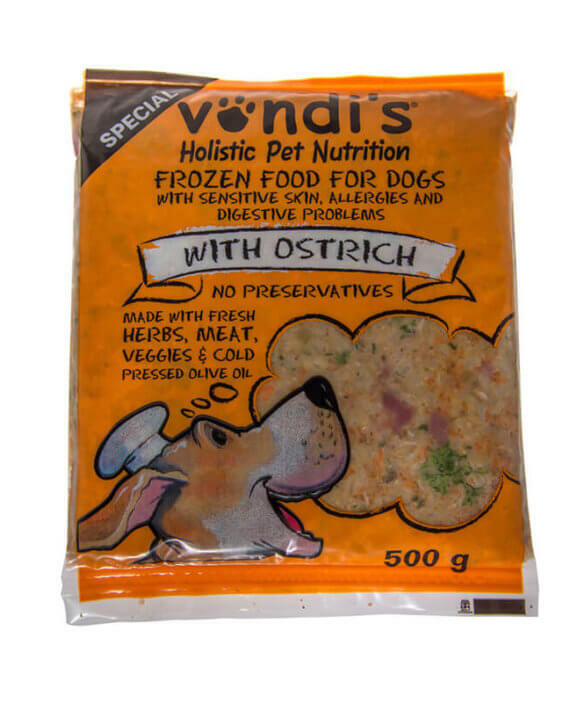 Vondi’s Rooibos Oil is taken orally so it is easy to administer over food or directly into your pet’s mouth. The medicinal and healing properties of rooibos and chamomile are well documented and are a must for all pets with skin conditions. 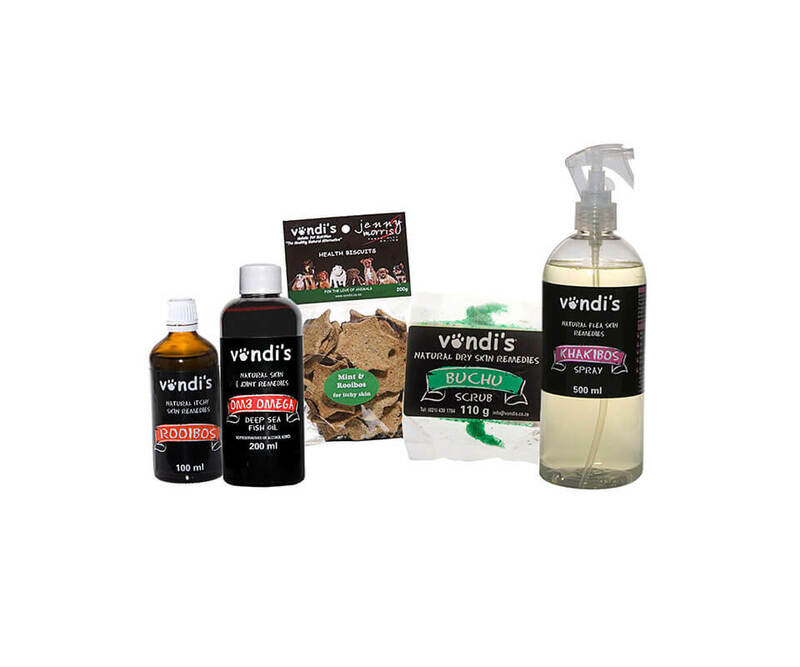 Vondi’s Natural Skin and Joint Remedies is preservative and alcohol free. Our Om3 Omega Fish Oil is a natural high concentrate and a source of highly nutritive omega 3 for your pet’s skin and joints. What makes Vondi’s OM3 Omega oil unique? Jenny Morris is one of South Africa’s most popular celebrity chefs. 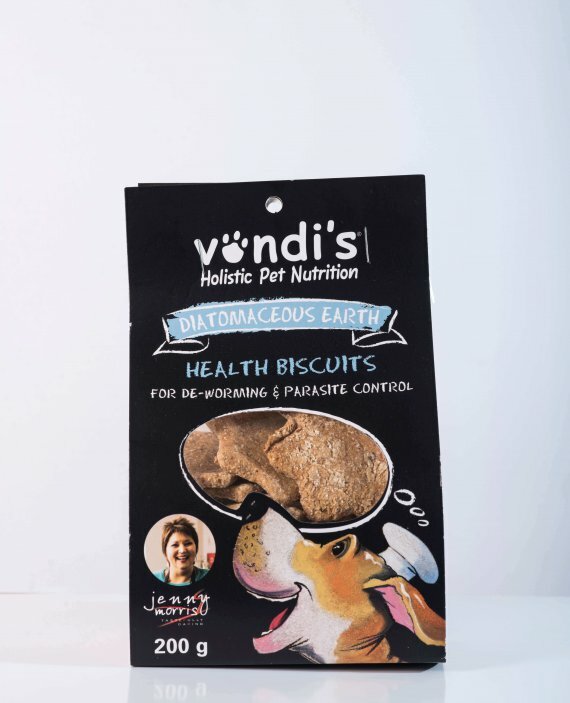 Together with Vondi’s they have produced a range of healthy biscuits for dogs. 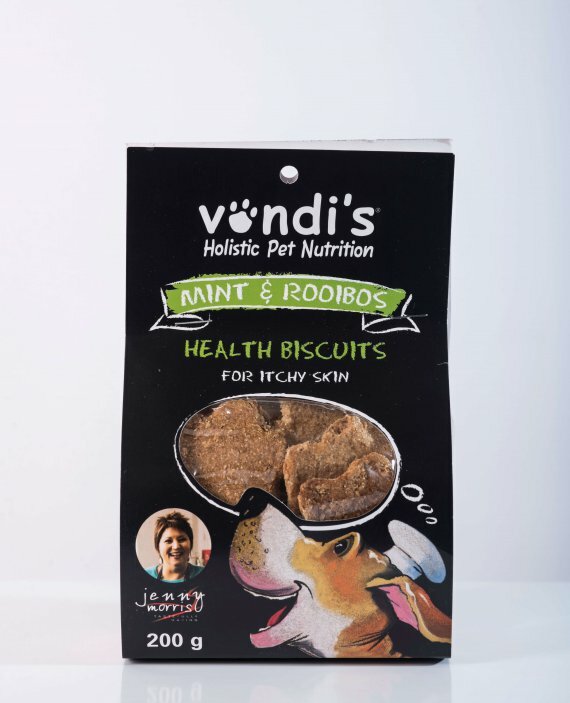 The Jenny Morris Mint and Rooibos Biscuits promotes healthier skin, thanks to the high concentration of zinc and vitamin D. Rooibos is also known for its anti-inflammatory properties. It boosts the immune system and fights free radicals. 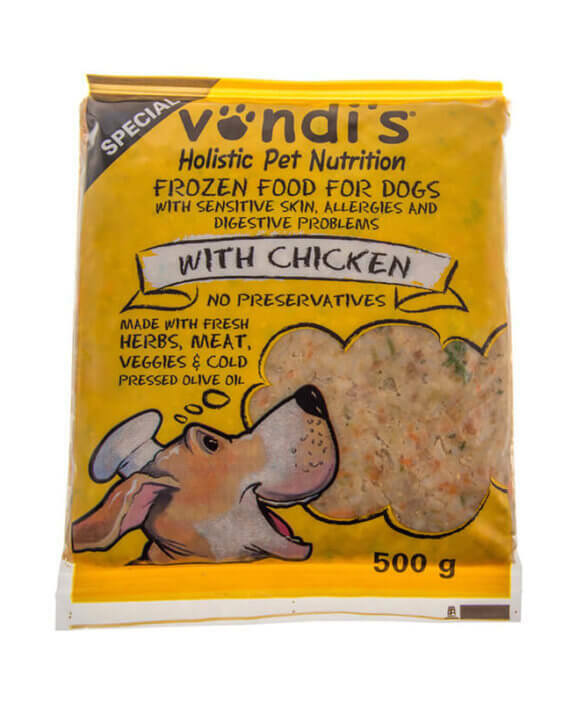 Immunity is everything and healthy pets are less likely to be affected by virus, bacteria, parasites and allergens. Rooibos (“red bush”) is a proudly South African product and is packed with many antioxidants and minerals, while mint works to reduce excess acidity and calm nerves. Mint is digestive, soothing, relaxing and sleep inducing. It is a digestive alkaliser and prevents mucus formation and sinus blocking. Mint also works for skin ailments and allergies that are caused by inflamed cells, which are the result of acidity.